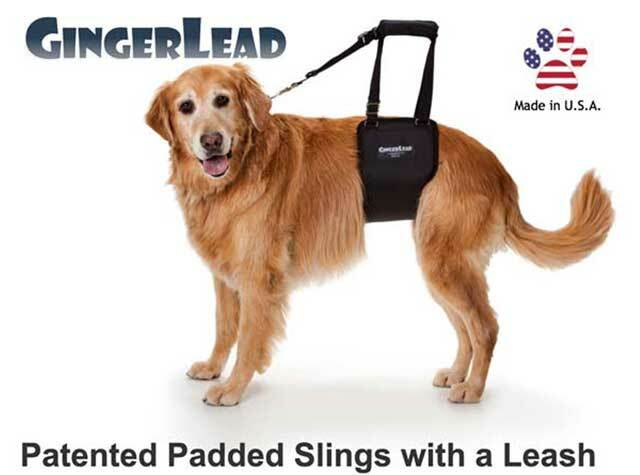 Use the GingerLead Support Sling to assist Tripawds and older or disabled dogs with limited mobility. Ideal for use during recovery from amputation or remaining limb surgery. Every dog is different, and Tripawds come in all shapes and sizes. Amputee dogs of varying ages will require different types of support. 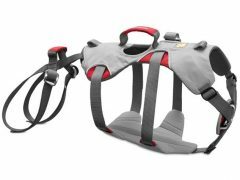 The GingerLead support sling provides direct torso and rear end support for dogs requiring additional assistance, with an integrated leash for walking and additional support when attached to a harness. It is ideal for post-op recovery and very beneficial for Tripawds recovering from remaining limb surgeries. 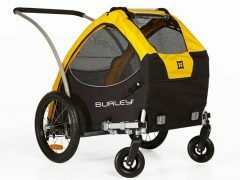 Great for helping dogs up and down stairs, in and out of vehicles, or out to go potty. Helpful aid for dogs suffering from arthritis, hip dysplasia, vestibular disease, degenerative myelopathy, or other debilitating conditions. Help care for dogs recovering from knee, hip or back injuries, or orthopedic procedures (TPLO, TTA, Total Hip Replacement, IVDD, or Amputation). The integrated leash may be attached to: (1) a collar for control of younger, more exuberant dogs recovering from surgery, (2) a chest harness for older dogs needing additional support, or (3) detached for machine washing or if your dog’s particular condition does not require the leash. Find best GingerLead price, sizing instructions and more reviews on Amazon. Be the first to review “GingerLead Padded Dog Support Sling” Click here to cancel reply.